Bethany Wilinski is an assistant professor in the Department of Teacher Education at Michigan State University. When Pre-K Comes to School traces what happens—for institutions and teachers—when a school district and community ECE centers partner to provide public pre-K. The author examines policy implementation across diverse sites—a private part-day preschool, a corporate childcare center, and a public elementary school. She demonstrates how pre-K partnerships create opportunities but also considerable constraints for the institutions and teachers involved. Though teachers are required to comply with the same policy mandates, their compensation and access to resources varies greatly. This book calls for policies and practices that will work better for teachers, which, in turn, will work better for children. 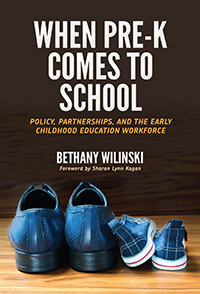 The book's unique, insider perspective on how policy is actually enacted in schools provides important insight into what communities and policymakers should consider when creating pre-K policies.